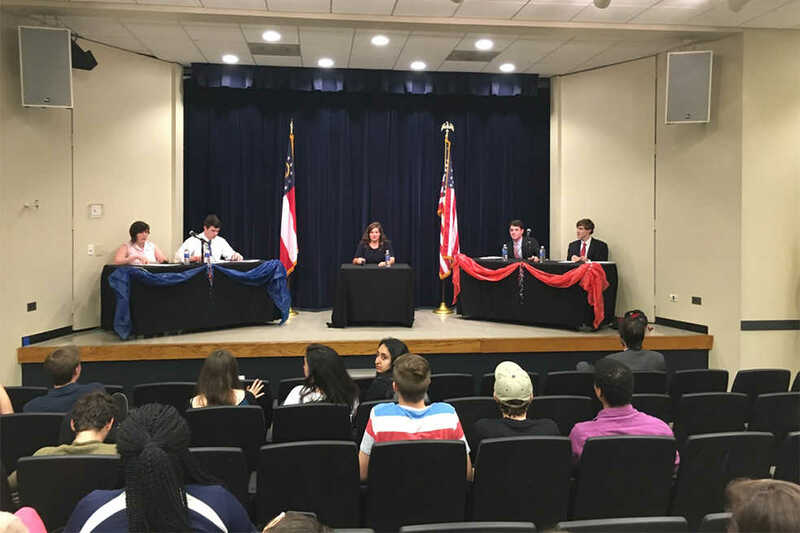 On April 13, the Student Government Association’s Government Relations Committee (GRC) ran a public debate, dubbed “Fight Night,” between representatives from both the College Democrats of Georgia Tech and the College Republicans of Georgia Tech. The debate covered a number of topics, including federal funding of Planned Parenthood, affirmative action in both education and the workplace, the idea of government-funded college, Georgia’s Campus Carry Act and obligations of the US towards refugees from Syria. These topics were followed by an audience-led Q&A section. The debate was moderated by Victoria Doris, third-year PUBP and the co-chair of the GRC. Both political clubs fielded two representatives. The Republicans sent their treasurer, Matthew Bowling, first-year BA and their Fundraising Chair, Cody Jones, first-year NRE, while the Democrats sent their president, Jake Orvis, second-year PUBP, and their former president, Amanda Nabors, PUBP grad student. Both teams were given the opportunity to respond or answer twice per individual question. The Republicans and the Democrats agreed on a number of issues including Campus Carry, indicating that individual universities should have the right to decide an individual concealed carry policy for themselves. Both parties also supported registration of weapons with campus police departments if they were carried by students or faculty. The Republicans and Democrats departed from consensus on the issue of the liability of universities in cases of campus shootings. Republicans maintaining that the legality of weapons on campus does not prevent the presence of weapons on campus, making it impossible to hold campuses accountable. Democrats advocated for a case-by-case analysis of a campus’s responsibility for a school shooting that takes place. Constitutionality played a large part in the Republicans’ arguments during the debate. In regards to Planned Parenthood, the Republicans argued that federal funding of the organization overstepped its limitations as laid out in the Constitution. They also maintained that taxpayer support of Planned Parenthood violated the First Amendment provision to freedom of religion, as many taxpayers have, according to the Republicans, religious objections to contraceptive care and to abortions. The Democrats rebutted this argument by maintaining that none of the money provided by the federal government to Planned Parenthood funds abortions, as well as that Planned Parenthood provided necessary services in poor regions that would otherwise have no access to healthcare. The parties had their most intense debate over the issue of student debt and the provision of funding to pay for students’ college educations. The Republicans clarified their position shortly afterwards, explaining that they had meant those with an inability to pay should seek scholarships and sources of funding that were not provided by taxpayers. The Democrats suggested that, while total subsidization of college expenses might not be possible, there could be measures taken to mitigate the amount of debt students accumulate, including expanding programs such as HOPE and taking measures to cap or limit the amount of money collected from loan interest per year or to lessen the effect of student debt on graduates. In comments by the representatives before and after the event, both parties indicated their support for events like Fight Night, praising the decorum of one another’s team members and expressing their desire for more outreach and inter-club activities for both the College Democrats and the College Republicans. The event had a turnout of about 20 spectators and was held in the Student Center Theater.